with the Irish Sea on one side and the estuary of the River Conwy on the other. St George's Hotel, built 1854, the new resort of Llandudno's first promenade hotel. Llandudno has been serving tourism in Wales for over 150 years. Located in Mostyn St, Llandudno's main shopping street, is the Town Library, an attraction in its own right, which is also surrounded by the acclaimed Victoria Shopping Centre. The Library is also the starting point of the Llandudno Town Trail. Within the library is the tourist information centre, an excellent local history reference section, a general library and a large computer suite. Another great attraction here at Llandudno, Punch and Judy still entertain the children in the traditional manner, just as they have always done. ‘Professor’ Codman brought Punch to Llandudno in 1860 and the Codman family still run the puppet show daily during the summer on the wide promenade near the pier. 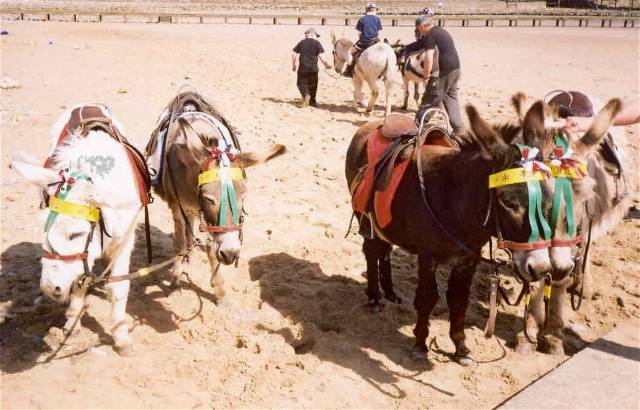 Donkey and Pony Rides have been a popular attraction on Llandudno’s sandy beach for over 125 years and continue to appeal to the children of all ages. They were introduced by Elizabeth Hughes (the Donkey Lady), and her descendants continue the tradition with others to the present day. The Victorian Pier, is one of Llandudno's greatest attractions. At 2,295 foot long it is the longest pier in Wales and one of the finest recreational piers in the United Kingdom. The Llandudno landing stage is still used by the Isle of Man Steam Packet Company for occasional excursions to Douglas and by the Waverley and Balmoral Steamer Preservation organization. On Llandudno's wide promenade by the pier entrance. A popular attraction on sunny afternoons. and both types of vessel normally offer trips daily during the long Llandudno season. The Mad Hatter presents his complements to the assembled throng watching the mid-day parade at that great annual May-Day attraction, the Llandudno Victorian Extravaganza, whilst the equally colourful Queen of Hearts harangues those on the other side with requests for a slight bow or a modest courtesy. 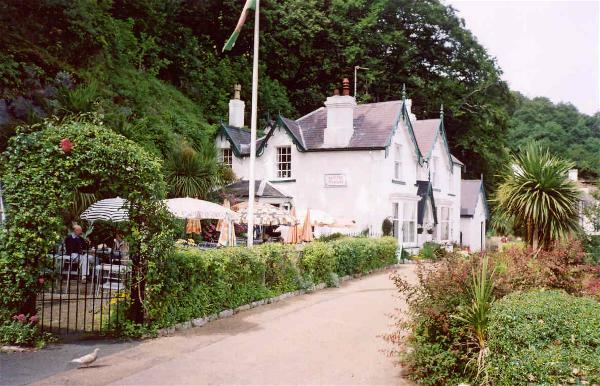 The real Alice, Miss Alice Liddell, for whom those famous "wonderland" stories were written by Lewis Carroll, spent her childhood summers at Penmorfa, the house that her father, Dean Liddell, built, as a holiday home, almost on the beach at the West Shore, Llandudno. See also: The West Shore Boating Pool. Venue Cymru, one of the greatest theatrical attractions in the whole of North Wales offering excellent drama, ballet, opera, ice shows, orchestral concerts, brass and military bands, musical comedy, pantomime and stand-up (or should it be stood-up) comedians. Venue Cymru is physically and dynamically linked to the adjacent North Wales Conference Centre. The Llandudno Museum at Chardon House (centre of picture) in Gloddaeth Street is a fine attraction for archaeologists and antiquarians. Some of its exhibits are illustrated on the Welsh National Cultural Heritage website at "Gathering the Jewels". Nearby is another of Llandudno's interesting attractions (in New Street behind the church, in the picture) a collection dedicated to that much neglected aspect of the 1939-45 war, The Home Front Experience. 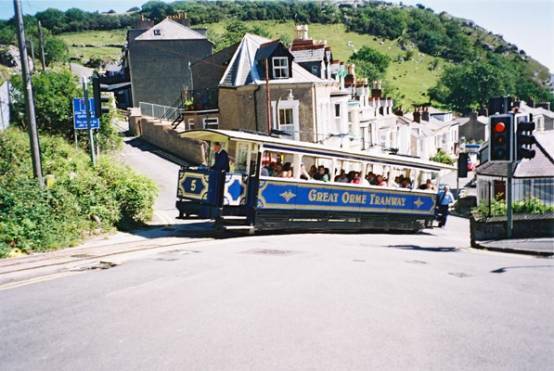 Take the Vintage Motor Coach tour from Prince Edward Gardens round the Great Orme via the Marine Drive. Or drive round in you own car and take a diversion to Saint Tudno's Church, or the Bronze Age Copper Mines or to the Summit. The toll of £2.50 includes parking on the Great Orme and at the Summit Car Park. Take refreshments at the "Rest and Be Thankful" café, just half way round the Marine Drive. On the northern side of the Great Orme, nestling in a sheltered hollow, is the church of Saint Tudno with its churchyard and the adjacent town cemetery, still in regular use. This little church, open daily during the season, was built in the 12th century on a Christian site dating from the 6th century and dedicated to the memory of its founder St. Tudno. For other churches in Llandudno visit Cytûn Llandudno Churches. Take the world famous Cable Tramway, one of just three cable hauled street tramways in the world and one of the great narrow-gauge transport attractions of North Wales, to the summit of the Great Orme. The tram climbs steeply up the very narrow Old Road and then crosses the five-way junction at Black Gate to join Ty Gwyn Road at its junction with Wyddfyd Road and Llwynon Road. The public bus service to Tyn y Coed crosses the line at this point. 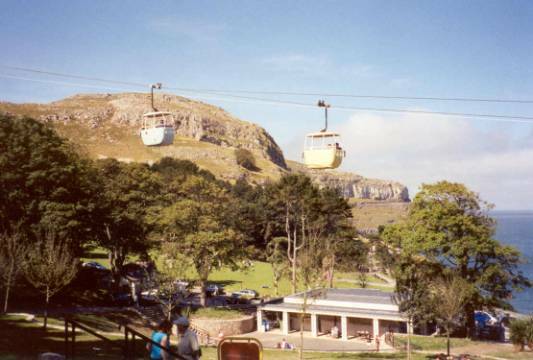 The tramway then runs at the side of Ty Gwyn Road to the half way tram station near to the Great Orme Bronze Age Copper Mines, another of Llandudno's world famous attractions, which can be visited before continuing by tram to the summit. 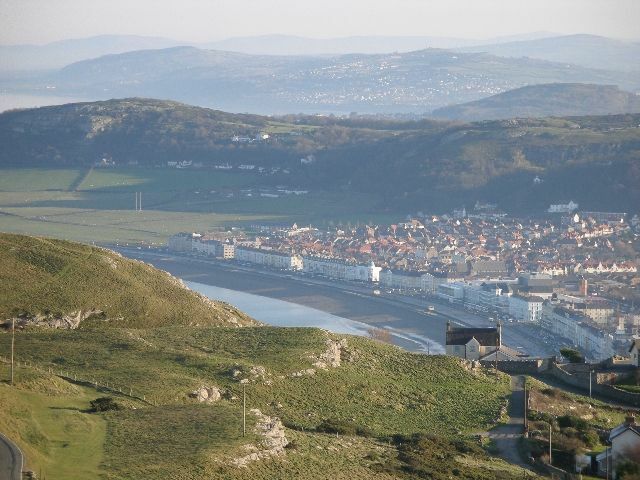 Travel by tram from the Victoria tram station in Church Walks or by aerial cable car from its Happy Valley terminus (see below) or take your own car, climbing the 1 in 4 ascent of the Great Orme to the Summit Complex. By car or on foot one can also travel via the Marine Drive (see above) to the copper mines and the summit. It is on the Promenade near St. George's Place that the Llandudno Lifeboat, with its tractor, can often be found at weekends. The lifeboat house is in Lloyd Street, midway between the two shores, to facilitate emergency launch from either beach. The lifeboat jetty can be seen on the left in the photograph below. Travel by alpine aerial cable car from the Happy Valley over the country park to the Great Orme Summit Complex and enjoy stupendous views all the way. 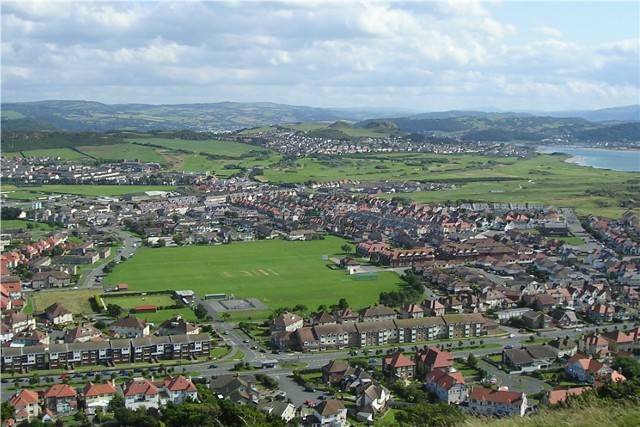 good shopping and behind the town are the twin mounds of Deganwy Castle. A new attraction at Deganwy is the Marina Quay Development. the Summit Cable Car and the Ski slope and toboggan run. The ski slope viewed from an aerial cable car as it climbs the Happy Valley high above the trees on the left hand slopes of the hillside surmounted by the Iron Age hill fort of Pen Dinas. At just over one mile from the Happy Valley to the Summit it is the longest aerial cable car line in Britain. Passengers travel four to a cabin and enjoy unrivalled views. Do visit the Haulfre Gardens on the south facing slope of the Great Orme - Llandudno's other gardens. An excellent place for a cup of tea or a light lunch. The house was at one time owned by Thomas Lipton, the Victorian grocer and tea importer. The gardens were first laid out by Henry Davis Pochin the inventor of white soap who went on to plant the famous Bodnant Garden in the Conwy Valley. The former Welsh Baptist Church at the corner of Llewellyn Avenue and Upper Mostyn Street is now used as the Llandudno Heritage Centre. The adjoining Schoolroom currently houses the ‘Stori Llandudno’ exhibition. The chapel is a perfectly preserved example of a 19th Century Welsh Baptist chapel with unique features. It was regularly used by Eglwys Unedig Gymraeg the United Welsh Church of Llandudno until 2006. Organised by Llandudno Town Council. was thronged with folk of all ages. Its a good show every year. as this photograph taken by Elwyn Jones on December 19th 2006 shows. the Llandudno Festival of Transport etc. and the North Wales Bird Trust. This independent website is compiled and published by Noel Walley. for permission to publish photographs should be made. All requests for tourist information including brochures, guides, and leaflets etc. The Library Building, Mostyn Street, Llandudno. Compilation and photographs © 2002/2007 by Noel Walley – last updated February 2009.